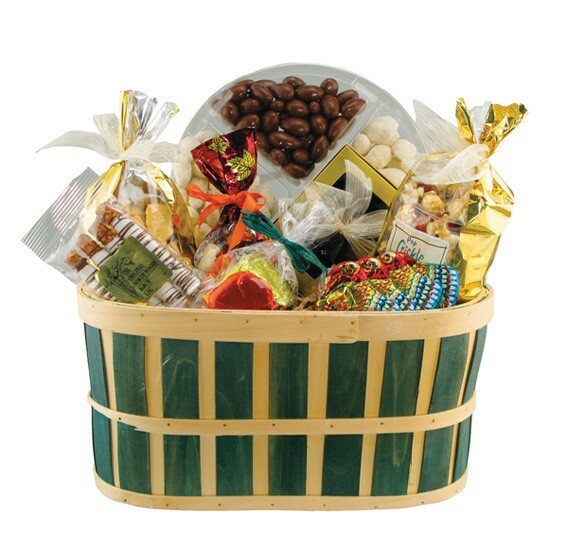 Woven wooden gift basket filled with 16oz bag of peanut brittle candy, 8oz bag of cranberry nut snack mix, 1 8oz bag of Autumn deluxe snack mix, 1 gift bag with 6 solid chocolate candy foiled fall leaves, 4 pc white chocolate candy dipped pretzels, 23oz round filled with chocolate candy almonds and white coconut almonds, 6 pc assorted chocolate candy confections gift box, and 4 solid chocolate candy foiled turkeys. Wrapped in cello and tied with your choice of ribbon color. Makes a great food gift or autumn thanksgiving holiday gift. Includes up to 4 color process imprinted label or personal card attached to the clear cello wrap..